Dog owners are being asked how Canberra’s dog parks can be improved, as part of a $200,000 project aimed at upgrading the safety and comfort of off-leash areas. Canberra has six official dog parks, located in Belconnen, Tuggeranong, Yarralumla, Forde, Casey and O’Connor. Parks provide a fenced in area preventing off-lead dogs running in front of traffic. Separate spaces are provided for small and large dogs, which aims to prevent big dogs hurting small dogs. “Our off-leash dog parks are amongst Canberra’s favourite community assets, providing people with a purpose-built facility to socialise their dogs and burn some energy,” said Meegan Fitzharris, Minister for Transport and City Services. “The Government has committed to further improving the six sites, with park users encouraged to share their ideas on where funding might best be spent. Canberra has 120,000 dogs, according to Transport Canberra and City Services. The most recent upgrade came in 2014 when lighting was added. Greenway, Lake Tuggeranong, Mortimer Lewis Drive from 9am to 10.30am. Yarralumla, park land near Weston Park from 11.30am to 1pm. O’Connor, park land on Fairfax Street from 2pm to 3.30pm. Forde, park land on Amy Ackman Drive from 9am to 10.30am. Casey, park land on Yeend Avenue from 11am to 12.30pm. Belconnen, Lake Ginninderra, Diddams Close from 1.30pm to 3pm. How wonderful to know how much money is spent on dog parks! !!! Why isn’t this money spent on keeping people safe from morons who own dogs. It seems as though the ACT wants to live in doggy La La Land!! Get a grip. Dog Parks are a good idea but, I wonder whether they are so necessary when much open land is zoned off-leash. Check the ACTmapi tool (http://app.actmapi.act.gov.au/actmapi/index.html?viewer=doma) and you may find that there are good off-leash areas close to where you live. Examples include Isaacs Pines (but not the Conservation Park), most of the LBG foreshores, a large area north of the Belconnen town centre and around Lake Ginninderra. There are off-leash areas of various sizes in most suburbs. So, how important for the ACT Government are the dog parks ? More dog-friendly areas doesn’t necessarily mean more off-leash areas. The trouble with dogs roaming around freely at parks is the sheer number of them that inadequately controlled by their owners even with their leashes on. Some dogs are incredibly antisocial in the way they run up to others “uninvited”. Other dogs do not deal well with aggressive little buggers getting up in their grill. Better to have more controlled spaces for off-leash activities. If you want space to let your dog run around, join a dog club and train it properly. The club facilities are usually quite spacious, as a bonus. 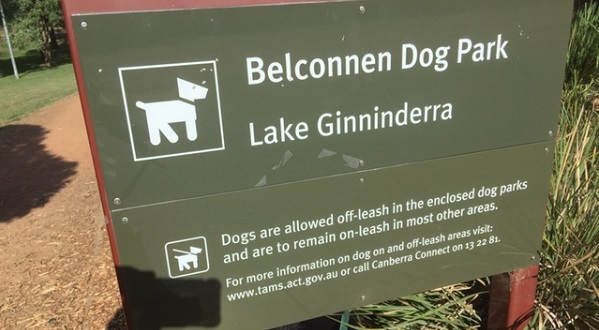 ACT Government should allow more parkland to have your dog of a leash. Dog parks are a sad indictment of how lazy we have become. Dogs are active and want to run sniff and explore. They don’t want to run around in circles on dirt patches while their owners sit on there laurels! Perth provide dog waste bags at every oval – that’s right every oval and allow dogs off their leash. What a great way to get your community active. They also allocated beaches just for dogs!!! Although ACT doesn’t have a beach…I challenge the ACT Government to get creative and innovative with how and where dog owners can exercise their dogs while getting some exercise themselves. Bunnings have got it right allowing dogs in their stores. The more dog friendly areas the more people are out and the healthier the community becomes. Agree with Catty. There needs to be maintenance of the dog parks. Our dogs love the park, but I have to think twice about taking the hairy one. There is so much dust! I know it’s difficult when the dogs are constantly running, but is there some way to keep the dust down? Also, could we have some snake-proofing? I understand there have been problems previously. More benches for some of the older folk to sit in the shade would be great and maybe separate entrances for the smaller dog area,seen some grief at the gate between the bigger dogs and the smaller ones.